I've been working diligently lately on Dunitz & Company's Pinterest account. The goal. 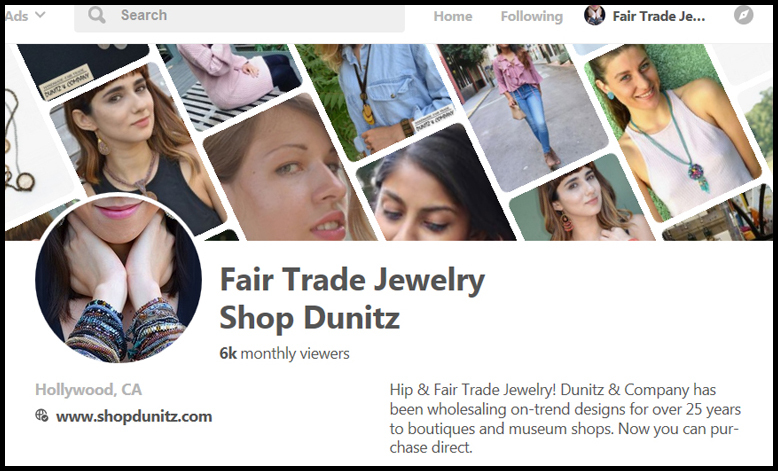 To have more active users follow, and hopefully purchase our fair trade jewelry so we can continue to sustain our artisans we've been working with for over 25 years. And while I've been spending more time on Pinterest, I've been reading lots of blogs posted by like-minded people. I always read articles specific to fair trade and those posted by my Fair Trade Federation colleague members. Now I'm also devouring articles on sustainability, ethical clothing brands, thrifting, repurposing & upcycling and zero waste. The blog posts available on these topics are endless. And as is courteous on Pinterest, I've learned it isn't always about you. So, in the spirit of sharing, I'm not only sharing oodles of model shots and links to Dunitz product, I'm also sharing (pinning as they say in Pinterest world) many blog posts written by others on all the topics I just mentioned. I've always been keenly aware of my Fair Trade Federation colleagues. I know the countries they work in and the products their artisans produce. I am not as familiar with the many clothing lines that are deemed ethically and socially conscious. But, I'm learning. I've always been into recycling and thrifting. Spending more time reading about these topics has been fun. It also got me thinking about how I have always used my own wardrobe for color inspiration. Yes, I watch Pantone projections closely. Yes, I watch New York and Paris runway shows. Yes, I'm inspired by nature. But, you know what? I'm also inspired by the colors I've always loved wearing. And yes, many of those colors are inspired by my old and/or classic thrift finds. I adore Aqua. Doesn't almost everyone? This must be the reason I gravitated toward this beach bum man's shirt at a Jet Rag Sunday sale. Jet Rag, a Hollywood vintage store institution, stages a crazy sale every Sunday in their parking lot. The hipsters, thrifters and hoarders line up to hopefully snag something cool. Everything offered is only $1.00. I've seen some shoppers duke it out over a pair of jeans or a designer label t-shirt. Mountains of stuff are sifted through at a furious pace while everyone dreams of finding the perfect addition for their wardrobe. (My guess is several are dreaming about the big bucks they can make reselling their discoveries online.) 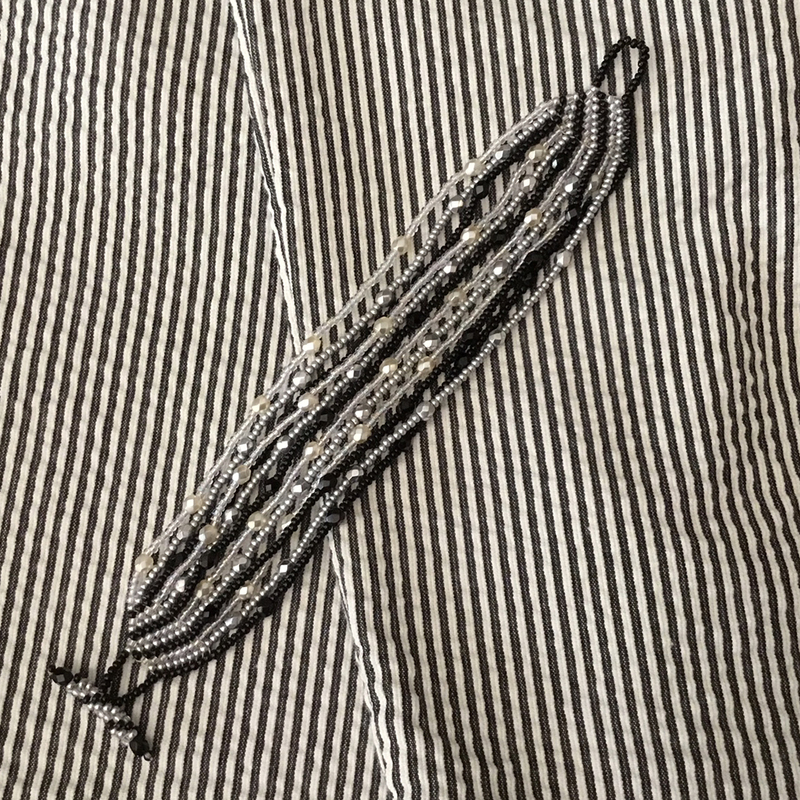 This, not so famous designer shirt, as it turns out has been perfect with jeans. And the colors of aqua, gold, jade, black & brown are loved by just about everyone. 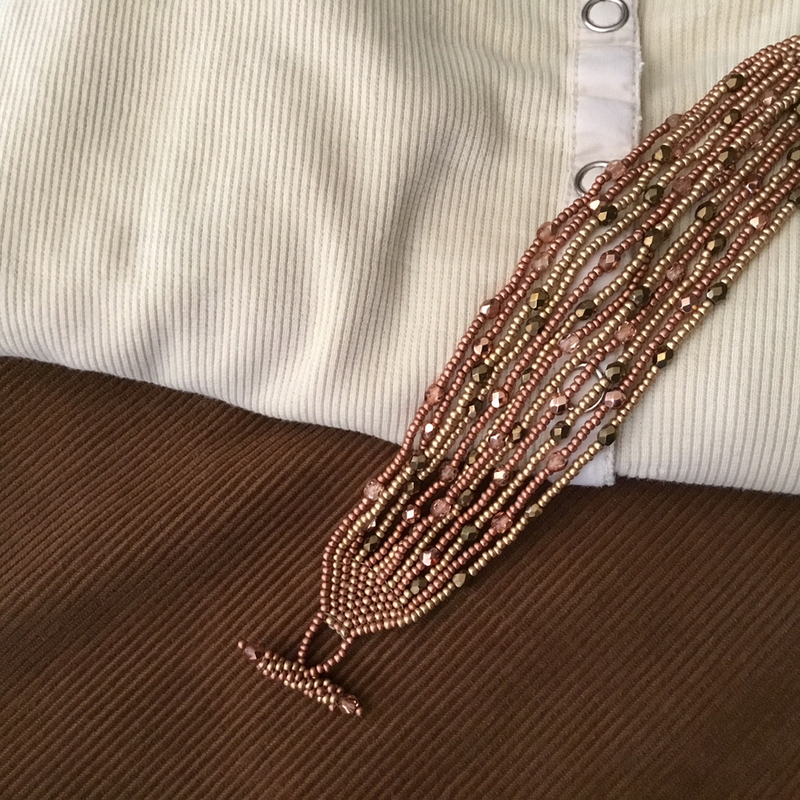 See that bracelet I propped on top of the shirt. That is Dunitz & Company's "Color #249"! 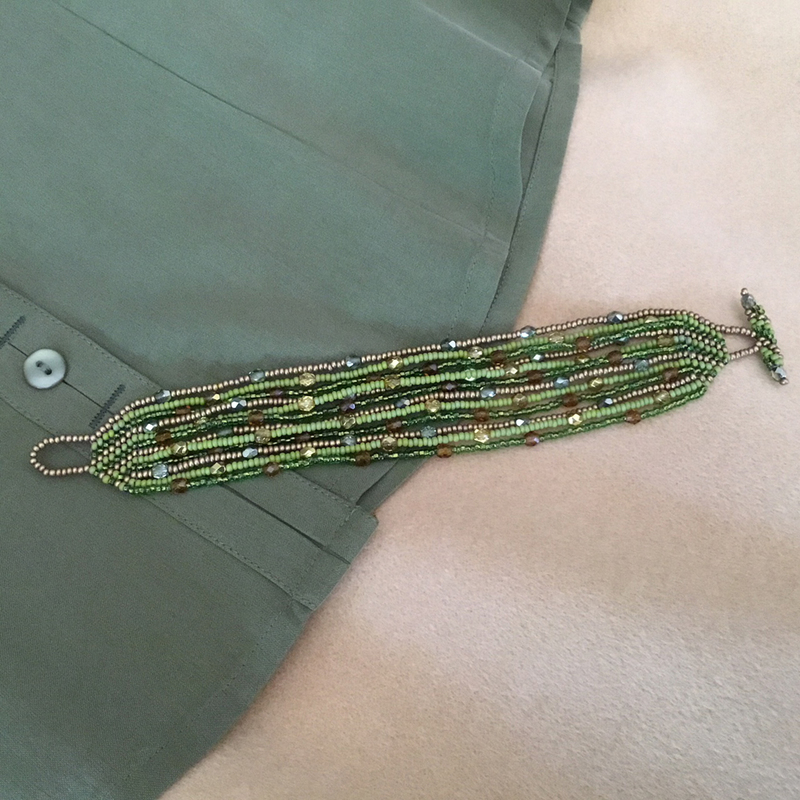 We'll be making loads of seed bead jewelry in this color combo this season. I've always been a nut for neutrals. And I have always been able to wear various shades of brown well. I also know that women in general love metallic colors. Gold and Rose Gold (or as we fondly call it light copper) together make spectacular jewelry. I will be wearing Dunitz & Company's "Color #236" all year long. 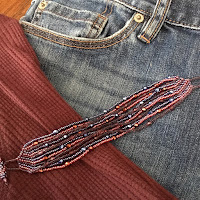 This coming fall, I'll be pairing it with one of my OLDEST tops that is frayed at the neck and sleeves with a pair of vintage straight leg cords I found a couple of years ago at a thrift store in Chicago. No, I can't turn this cotton shirt into a cleaning rag. And - if you're from the Chicago area, you are incredibly lucky. I don't know if Chicago has the best thrift stores of any city I've been, or if the friend I was palling around with had already done her homework. 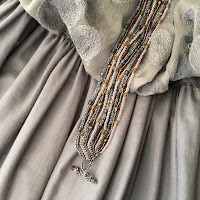 I just read an article from Pantone stating that gray is projected as the "big" color for just about everything for Fall 2019. Gray will be everywhere. On cars, home decor textiles, men's clothing and interior & exterior painted walls. It seems only last year we were hearing "Gray is the New Black." Maybe Gray just never goes out of style. It perfectly aligns itself with silver. And we know women love silver when it comes to jewelry. I dig all shades of gray when it comes to clothing. Gray can be tinted green, blue or purple. These two pieces of clothing have been in my wardrobe forever, both having a more purple caste and are total treasures. The skirt was my mother's before me. Which means she purchased it in the 1970s! It's from Yves St Laurent. As long as I fit in it, it's not going anywhere. Fashion tip from me. 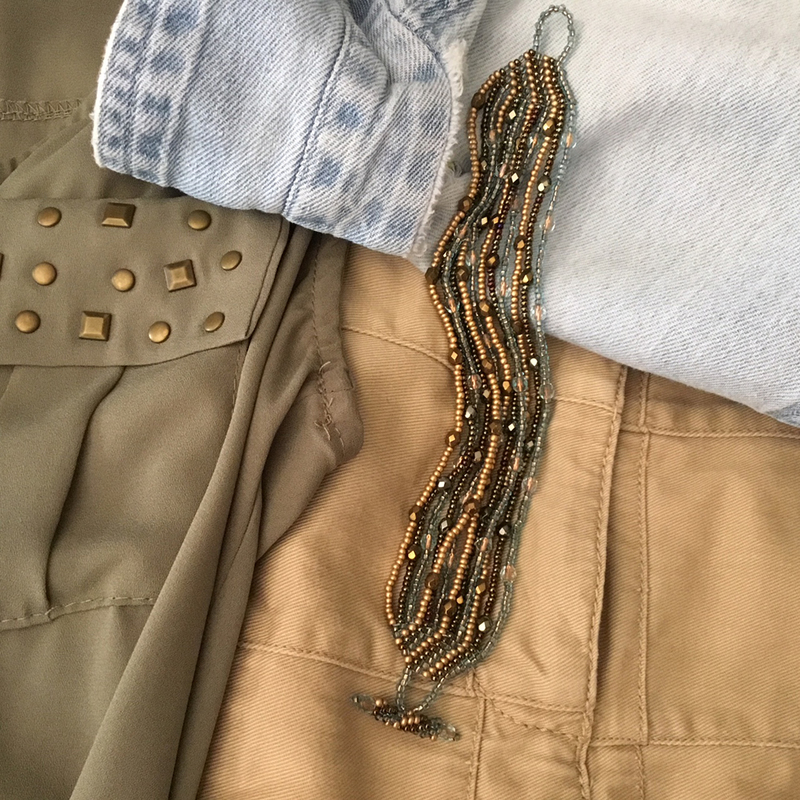 If you wear a monochromatic look (top and bottom the same color) you can easily dress up any outfit with accessories of many colors. 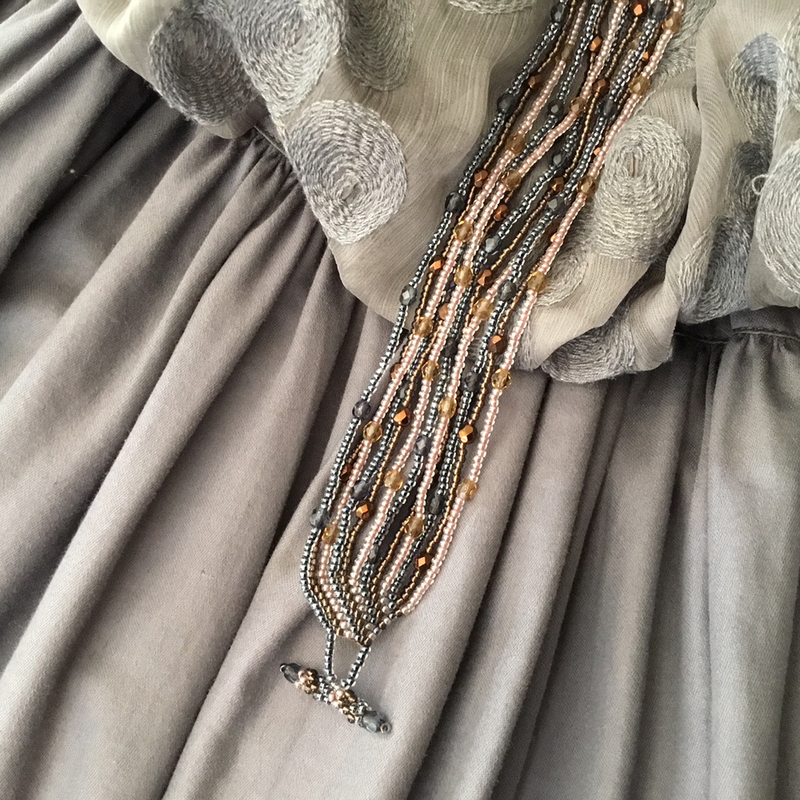 I've paired my outfit with Dunitz & Company's "Color #276" which combines gray, beige and a pale bronze. Will you be wearing gray clothing this next season? You'll be right on trend. Now let's talk about classic style! Black & White (or add a bit of silver to the mix), is always a fan favorite. I even focused on Black & White on a prior blog entry. 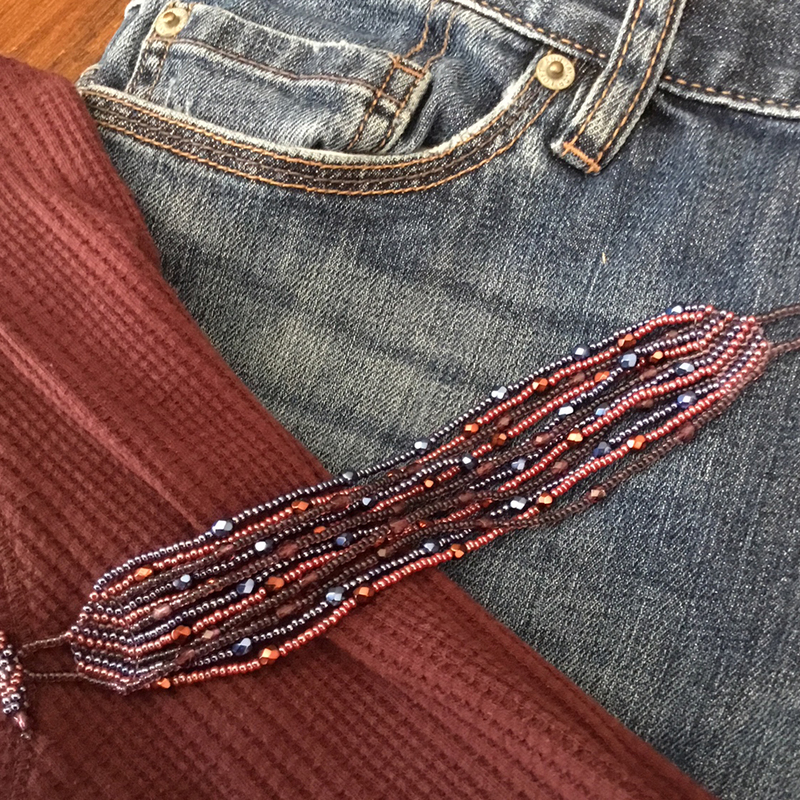 This color combo is such a staple that Dunitz & Company's "Color #351" was not only offered in Spring, we will once again show jewelry in this combo for Fall wardrobes. 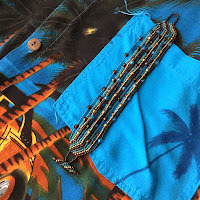 For the purpose of this blog, I had to couple this bracelet with a pair of old seersucker pants. I'm absolutely crazy for seersucker. I'm not sure if these shrunk the last time they were washed. Or if I gained a couple of pounds. The thrifter in me says keep them around. Maybe they'll fit next summer! Boyfriend Jeans. Ah, I love them. Hip and just a bit baggy so they are comfortable. I also know that the ones offered by Ann Taylor Loft (sorry, not noted as an ethical brand) fit me so well. The solution? For me, it's Ebay. When I shred my jeans up so they are no longer wearable, I look for a second-hand pair online that someone else decided to get rid of. I recently read an article from Green America that suggested buying used clothing on Ebay was a good way to help our planet. Phew. It seems almost everything matches jeans. Paired up with an old burgundy - purpleish hoodie, Dunitz & Company's new "Color #357" is a sublime coordinate. BTW, if you're in the Los Angeles area on the second Sunday of the month, check out the Rose Bowl Flea Market. There are great finds everywhere. 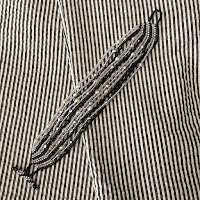 Focused on clothing? Head to the last lot where you find mounds of shoes, jackets, hats, scarves, jeans - you name it. I'm sure this is where I found this hooded shirt. Sometimes I recycle color combinations. This one, Dunitz & Company "Color #79" was originally offered in 2004. This combination of olive and greenish-gold was always an all-time favorite of mine. 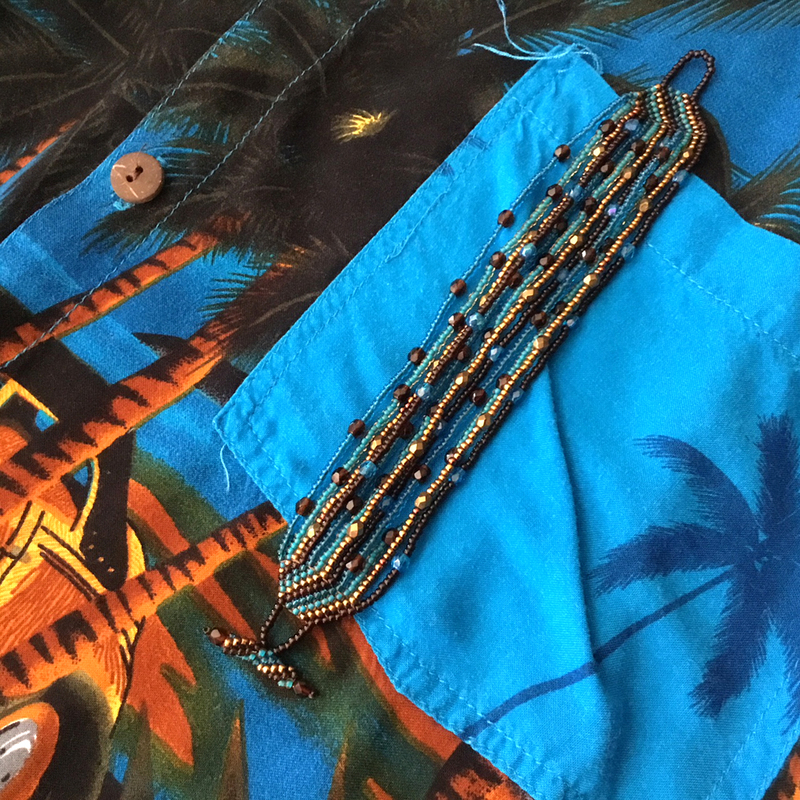 I'm thrilled to have it in our fair trade jewelry line up for the upcoming season. Time to drag some clothing out of the back of the closet! 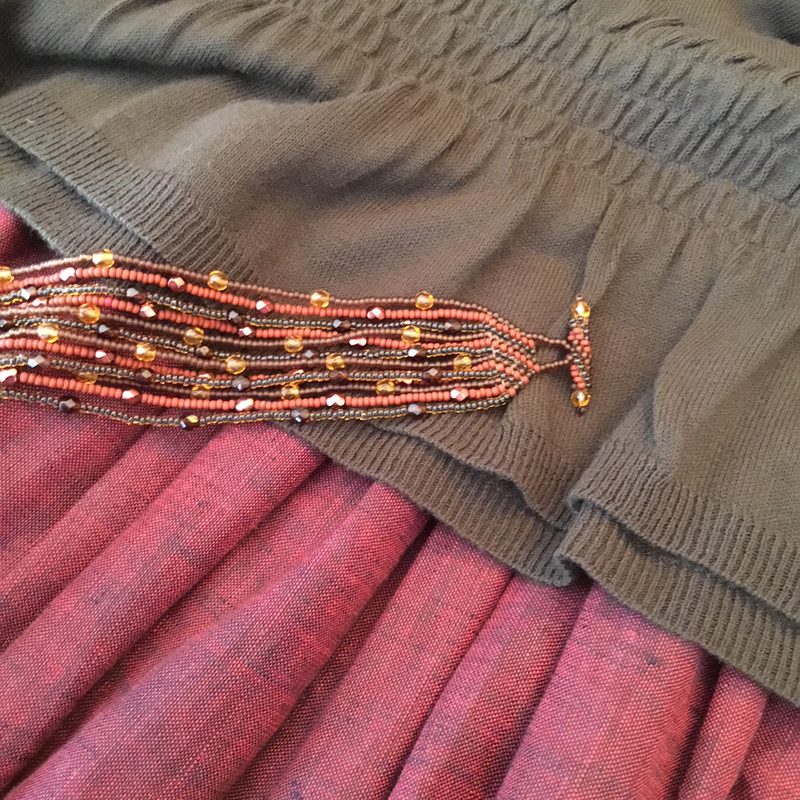 This skirt (part of a suit, inherited from my mom. 70's again, I'm certain.) is quite a bit brighter than my iPhone could capture. As is the army green blouse. 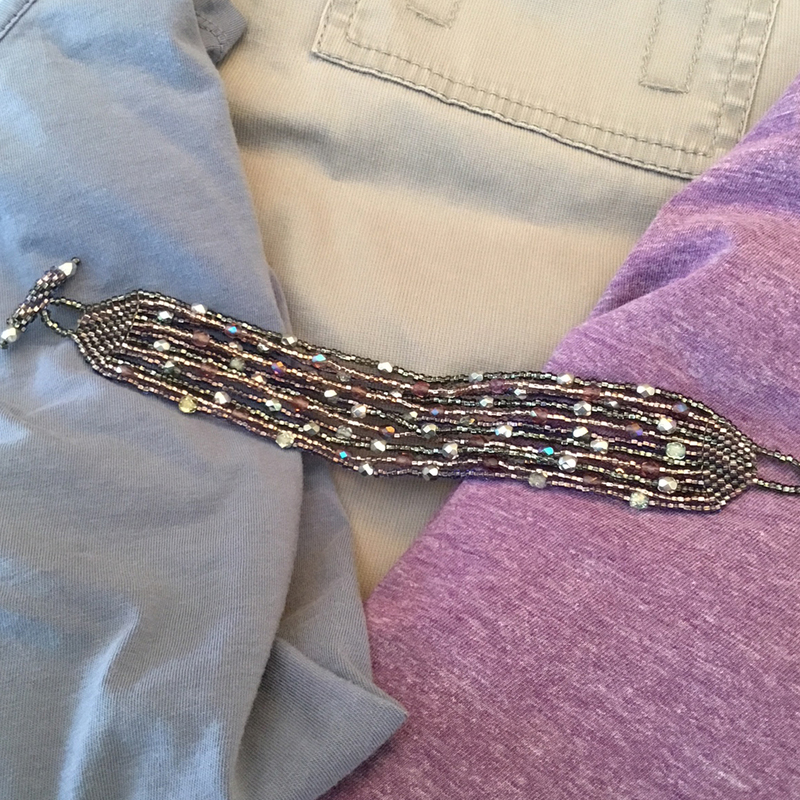 When I wear this ensemble, I think I'll be layering oodles of long medallion strands in this very color. Often I tweak popular color combinations. It keeps things more interesting for the shop owners who visit my wholesale booth at trade shows. And it keeps work more fun for me. Did I mention how gray seems to always be on-trend? 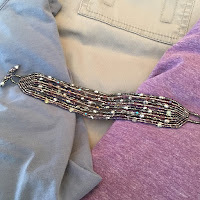 This season I paired a metallic gray with sapphire (very on trend) and amethyst. Dunitz & Company's "Color #355" is sure to please. And I can wear it with my purple t-shirt snagged from a Goodwill 'closeout outlet' center. Do you have one near you? I believe there are only two or three in Greater Los Angeles. One closed. A new one opened. Typically you'll find tons of other pickers and needier folks foraging through enormous bins. Then you pay by weight. It's quite an experience. Over the years, I've learned that any shade of brown paired with any shade of blue is typically well received. Of course, more on-trend shades of brown and blue will produce even more winning combinations. I'm hopeful that Dunitz & Company "Color #251" will please our fans this upcoming season. 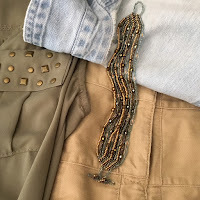 Metallic gold, metallic bronze (can look a bit green when paired with green) and pale aqua blue will be great with brown, green, tan, gold.... & DENIM. Yes, denim blue. See that denim shirt I plopped in this photo? It has holes (one folded over in this image) everywhere. I absolutely cannot part with it. And I'm certain that greenish sleeveless top was another one of my Goodwill outlet finds.